"I MUST do that." Every time I drive through the Karangahake Gorge en route to Waihi or further afield I remember what a stunning spot this gateway to the East Coast is. This gorge along the Ohinemuri River is so stunning it smacks you right between the eyes. I often pass through feeling envious of the people who've left their cars and are walking the historic mining and railway tracks. So, earlier this month I teamed up with a friend, we packed our bags and headed to Karangahake for a relaxing weekend. Relaxing if you include walking as a soothing pastime. I do. There wasn't really much of a plan. We hit Auckland's Southern Motorway with empty stomachs and stopped for dinner in Paeroa, where we found the delectable, but oddly decorated, Kumar's Something Special Indian restaurant on the main drag. It was dark when we arrived at DoC's Dickey Flat conservation campsite for two nights' stay. 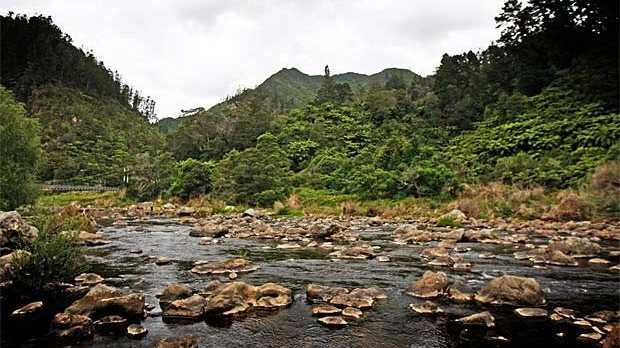 The campsite is basic, but perfectly located beside the Waitawheta River, which has an excellent waterhole for swimming. There's no electricity or treated water, but the campsite does have the luxury of brand-new long drops. Anyone looking for more luxurious accommodation than a DoC campsite ought to make a beeline for the Ohinemuri Estate Winery and Restaurant, just a couple of minutes' walk from the centre of Karangahake. It rents a self-contained apartment. At daybreak on Saturday, we discovered we had erected our tent in the middle of the car park by mistake. After we'd moved it to a more picturesque spot by the river, we donned our walking shoes to tackle the Karangahake Gorge Historic Walkway. 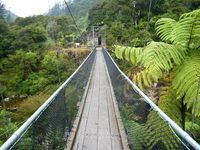 The walkway starts from the Karangahake Hall, meanders up the Ohinemuri River for a couple of hours following an old tramway at first and then joins the former Waihi-to-Paeroa railway track. The track loops back across a 1905 steel truss bridge and through the 1km-long Karangahake tunnel. We'd been warned of the wetas on the roof of the brick-lined concrete tunnel. We peered as hard as we could, but didn't see any. The walk through the 1km-tunnel seemed to take forever, but finally we popped out the end, and crossed an old railway bridge to the Crown Mine battery, one of the many ruined mining relics in the area. We ended our day's excursion with a coffee at the Talisman Cafe. The walk itself is easy, just 7km on a very gently sloping trail. 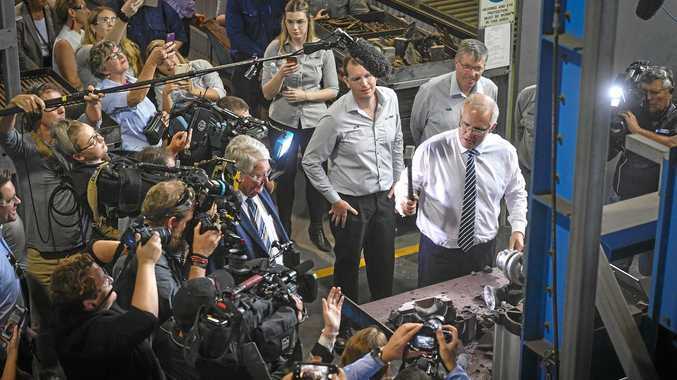 It would be possible to knock it off in an hour-and-a-half. But expect to be delayed over and over again by the remnants of early mining and railway development. Along the way we came across the remains of three ruined mining batteries - where gold and silver bullion were separated from ore.
We learned from the numerous signs how water- and steam-powered stampers crushed the quartz, and cocktails of potassium, cyanide and other nasty chemicals helped with the extraction process. One of the batteries even cooked the quartz to remove the valuable metals within. Ground-breaking mining processes were invented in the gorge during the mine's heyday from the 1880s to the 1950s and exported to far-flung parts of the world. Perhaps the most amazing thing about the Karangahake Gorge Historic Walkway was that it wasn't the best attraction the valley had to offer. That surprise came the next morning after we rose early with a plan to walk the 90 minutes from Dickey Flat, through the Waitawheta Valley to Karangahake township for brunch at the Ohinemuri Estate Winery. The track is even more stunning than the gorge walkway, yet suitable for virtually anyone who is capable of putting one foot in front of the other. The scenery is breathtaking. Sheer hillsides plunge into the river. Yet life is easy for the modern walker, thanks to legions of miners who cut a narrow tramway into the hillsides for the Crown Mine. The gradient is easy. No huffing and puffing over the steep hills. It's tunnels and swing bridges instead. There are two main tunnels on this walk. 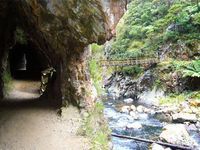 The first we traversed on the track, and in some ways most spectacular is the Crown Track Tunnel, which is 180m long and not much more than 2m high. Just high enough for the horse-drawn mining trucks that carried quartz back to the Crown battery on the Ohinemuri River. As well as mine "rubbish" - or historic relics - the Karangahake and Waitawheta rivers are dotted with excellent waterholes. The best one we tried was shortly after the tunnel and before we reached the Crown Mine. The Crown Mine, which during its life produced 357,736 ounces of gold and silver bullion, is made up of 12km of intersecting tunnels and plunges 243m below the level of the river, covering 163ha. Needless to say that it's not safe down there and the main entrance is blocked off - as are many mine entrances we encountered during the weekend. Shortly after the mine, another swing bridge heads over the river for a quick side trip up into a tunnel that took us to the ruins of the underground Woodstock Pumphouse, resplendent with original wooden mining trucks. The final section of the walk rises up to another tramway, which passes through the Woodstock Mining Tunnel. The tunnel houses a replica tramway built by DoC in 2005, and stunning "windows" out the side of the tunnel on to the river, where miners would throw waste rock. The great thing about the Crown Track and the Crown Windows Walk is that you don't need to go all the way to Dickey Flat. 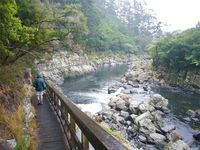 An hour's leisurely return walk from the Karangahake car park is all it takes to soak up the best of the valley's attractions. These walks really should be on everyone's bucket list. They're set in some of the North Island's most spectacular scenery, yet don't even require average fitness. 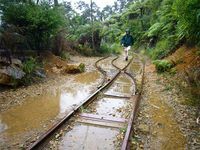 Railway enthusiasts can board the Goldfields Railway, which leaves from the eastern end of the Karangahake Gorge Historic Walkway for the short return trip to Waihi. Also along the route, the Victoria Battery Tramway Association of Waikino operates on Sundays and runs around a 1.2km circuit among the ruins of the Waihi Mining Company's huge battery. The association's museum is also open on Sundays. There's more. Little people will love a trip to the Bullswool Farm, a petting farm a few minutes' drive from the gorge. And from the sight of several men we spotted waist deep in water, the fly-fishing can't be bad either. Dickey Flat conservation campsite. Ph: (07) 578 7677. Ohinemuri Estate. Ph: (07) 862 8874. Goldfields Railway. Ph: (07) 863 9020. Bullswool Farm Park. Ph: (07) 862 8843. Paeroa Information Centre. Corner of Taylors Avenue and Seymour St in the L&P Cafe building. Ph: (07) 862 8636.